Here's how to create your own all-over patterns. 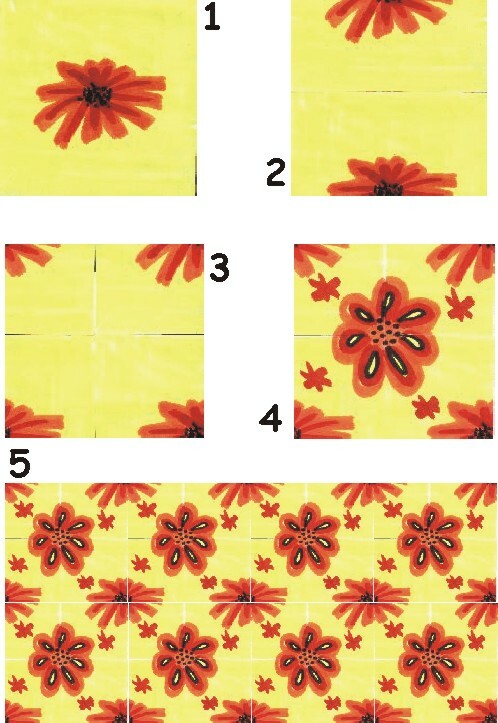 (1) On a square piece of paper, draw or paste the first element of your all-over pattern. Carefully cut paper in 1/2 side to side. (2) Move the top piece to the bottom of the square and use tape (ON BACK) to hold seam precisely. Carefully cut the paper in 1/2 top to bottom. (3) Move the right piece to the left of the square and use tape (ON BACK) to hold seam precisely. (4) Draw or paste the second element of your all-over pattern to the center of the newly formed square. (5) Scan square into graphic program and save. Used as a 'tile' it will create an all-over pattern where all elements meet in a continuously repeating sequence.